Need an Independent Home Appraisal in the Houston Galleria Area? Our Texas certified real estate appraisers perform residential and commercial appraisal services throughout the Galleria area for both private use and lending usage. Our goal is to supply our customers with a fast, accurate and comprehensive appraisal service that meets or exceeds their expectations and requirements for use. We have some of the most competitive appraisal costs in the area and are known for delivering completed assignments faster than the typical company. We only staff appraisers that are local to the Houston area and are experienced with its various markets. Our staff is capable of completing jobs for residential, commercial or mixed-use properties. For commercial assignments we only employ Texas Certified General appraisers with a minimum of 10 years of experience in the Houston market. We take pride in delivering real estate appraisal services for any need including lending, private use, insurance and legal issues. Whether you’re a homeowner or an industry veterans, we take pride in providing a friendly and reliable service. If you have any questions or you’re ready to request an appraisal, please call the phone number on this site or complete the appraisal request form found above. 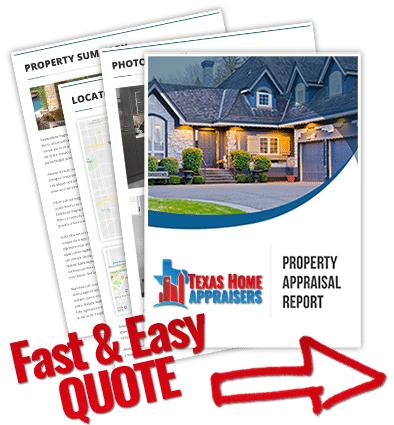 If you require a residential houston appraisers to provide a quick and accurate appraisal for your home, give us a call today or complete the fast online quote form. The appraiser typically doesn’t need any documentation from you to complete your assignment, unless there are special circumstances where you have information that needs to be considered. With that in mind, if the appraisal is for a sale the appraiser will almost always want to see the sales contract. There may be certain aspects of the contract that could impact the appraisal value. Though usually unnecessary, the following documentation could prove helpful to your appraiser: A property survey of the house and property. A deed or title report showing the legal description. If selling, a list of personal property that will be included in the sale. A list of recent improvements & cost as well as any other information you feel may be pertinent. A copy of your floor plan or a blueprint of the home is usually helpful to an appraiser as well. An appraisal contingency protects the buyer by giving them an “out” of the contract should the home not appraise (i.e. the value of the home comes in lower than the sales price). For example, if you go to buy a home for $325,000 with an appraisal contingency and it appraisers for $310,000 then you can either walk from the deal or renegotiate down to $310,000.